Official Windows 10 Ninjacat Wallpapers - Surprise! No matter how much loss Microsoft has incurred this year, as revealed in Q4 FY15 earnings call, it is certainly going to have some major profits once Windows 10 hits the devices. Folks at Microsoft managed to keep the hype up around the upcoming Windows which will be working as a service with Insider builds releasing every week, and sometimes even more frequently. Now that we are almost done with the PC Preview builds as Redmond signed off release to manufacturing, company is trying to not let the hype die down with more pleasant capers. The latest Windows 10 Insider build 10240 has apparently received the “highest-satisfaction rating of any build” so far released based on the pop-up surveys that the company uses for Windows Insider feedback. 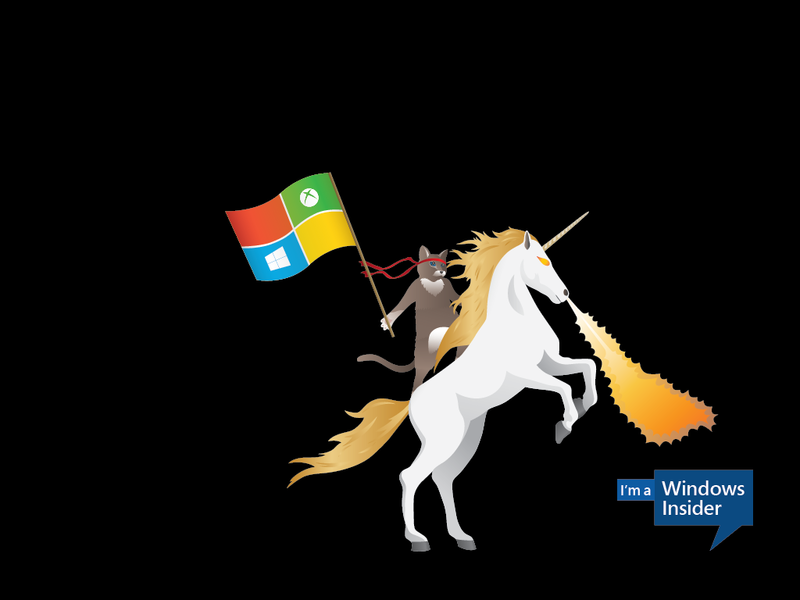 As we make our machines ready for the Windows 10 adoption, don’t forget to download these Windows 10 Ninjacat wallpapers where ninjacat is proudly riding three steeds including a fire breathing unicorn – unicorn! Personally, I believe Tyrannosaurus Rex wins over everything else.